Sidley United Football Club is seeking to sell its seated spectator stand. The stand has a seating capacity of 112, plus space for three wheelchairs, and is still in situ at Sidley’s former home at Gullivers, which has been closed since April 2013. 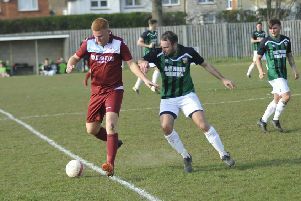 Sidley were a Sussex County Football League Division One club back then, but took a year’s break following the loss of their ground before returning to action in September 2014 as an East Sussex Football League team playing home matches at Hooe Recreation Ground. The club wrote on its Twitter page: “Sidley United are re-listing our 100 seater stand for sale. Due to Rustington FC pulling out of a deal, we are looking to sell to any interested party. The stand was built in summer 2008 and officially opened during a friendly against Eastbourne Borough in February 2009. It was paid for out of a memorial fund set up by the club following the tragic deaths of Sidley players Liam Cox and James Duffell in a car accident on their way home from a club training session on October 23, 2003. Gullivers was closed after Sidley Sports & Social Club - which Sidley United was affiliated to - ceased trading due to financial difficulties. Last month a planning application was submitted for up to 70 new homes on the disused site.